alarum and nuisance - though were it my own I'd not feel that way so much. Should we feel that there were the slightest danger to have a child, we wouldn't. All the family in the world, wouldn't mean a thing without you. The finest home we could have, would be an empty house if you weren't there. 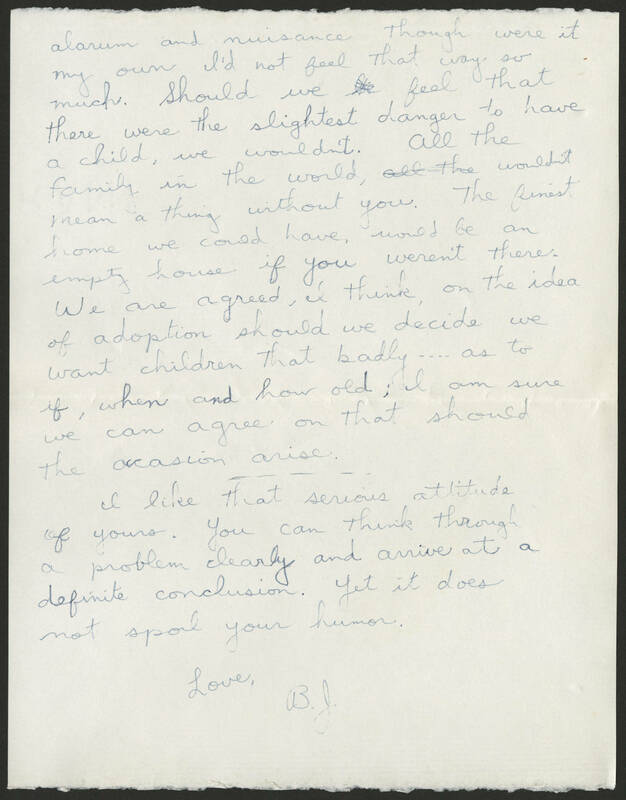 We are agreed, I think, on the idea of adoption should we decide we want children that badly ... as to if, when and how old; I am sure we can agree on that should the occasion arise. I like that serious attitude of yours. You can think through a problem clearly and arrive at a definite conclusion. Yet it does not spoil your humor. Love, B.J.